“Well hell. I guess this is it,” begins Scalped #60. Those words are uttered by a man with two bullet holes in his chest. It’s an appropriately blunt way to start the crime comic’s final issue, with simple words spoken by someone covered in blood, not all of it his own. The speaker is Catcher, the prophet/homicidal maniac who became one of the book’s many villains over the course of the past 60 issues, and like most of the characters in this series, he’s ultimately responsible for his own undoing. Since Scalped’s debut in January 2007, Jason Aaron and R.M. Guéra’s series has been a consistently tense, action-packed, character-driven read, turning the Prairie Rose Reservation into one of the most immersive settings in comics. The story was building to the Mexican standoff between Catcher, Dashiell Bad Horse, and Lincoln Red Crow at the end of last issue, and the two bullets inside Catcher are the first two nails in this series’ coffin. It’s appropriate for the brutally violent series to end with some grisly deaths, and it’s a bit of a surprise that there isn’t more bloodshed by the issue’s end. Switching from monosyllabic words to the poetry of John Donne, Catcher stumbles away as Dash checks in with Red Crow, who Dash also shot, because at this point he has to cover his bases. As Dash considers shooting and scalping a fleeing Catcher, in rushes insane FBI Agent Nitz, who chokes Catcher to death as they’re both engulfed in the flames of the burning Crazy Horse Casino. One by one, each of Catcher’s past mistakes catches up with him, earning him two bullets in the chest for killing Gina Bad Horse and two hands around his throat for killing a pair of federal agents in 1975. Nitz was consumed by his obsession a long time ago, and as he dies, he sees his dreams finally achieved: Lincoln Red Crow’s empire is destroyed, and the killer of Nitz’s FBI brethren is dead by his hand. And all he had to do to succeed was give up everything he ever had. Legacy has been a major theme of Aaron’s story, and when Dash saves Red Crow from the fire, Red Crow immediately begins trying to convince Dash to stay and join him as his partner. Red Crow still thinks he can salvage the shambles of his life, he just needs the one thing he never had: an heir. His daughter turned away from him, and he shot the last person who truly loved him, so in his desperation, Red Crow turns to Dash. Dash refuses, telling Red Crow he’s finished as he walks away into an uncertain future, leaving the old man behind in a pool of blood. It took 60 issues, but Dash knows nothing good can come out of associating himself with Red Crow, so he does what he does best: run away. After the opening bloodbath, the issue takes a three-month jump to check in with the rest of the book’s primary cast and close up any loose ends, beginning with Dashiell’s two love interests: Carol Ellroy and Maggie Rock Medicine. They’re both at the funeral for community healer Granny, the woman responsible for pulling Carol out of her crippling heroin addiction and giving her a new outlook on life. The legacy theme is heavy in this scene, with both Carol and Maggie taking on new roles in the community as the old generation fades away. Maggie has become the new Tribal Council President following Red Crow’s fall from grace, and unlike her predecessor, she’s striving to rebuild the reservation through things like community centers instead of casinos. Carol has become the new Granny, and when a mother who thinks her son is using drugs approaches her, Carol invites the woman over so they can get to the bottom of the situation and help the boy before he falls too far. As Carol tries to heal the community, Dino Poor Bear continues his ascent up the Prairie Rose crime ladder, making him the Lincoln Red Crow to Carol’s Gina Bad Horse. Enemies in this series are often much more similar than they believe, and the fate of Red Crow finds him taking on Catcher’s role as a wanderer of the land, joined by his trusty “dog” Shunka. He’s even taken on a bit of Agent Nitz’s personality, and the first panel depicting Red Crow’s new status quo shows him engaging in a favorite activity of Nitz’s as he pisses all over the tombstone of the deceased federal agent. Red Crow’s power corrupted him, and stripped of it all, he finds peace in a more humble existence, living off squirrel and rabbit stew and sleeping under the stars. It’s a nomadic lifestyle, but one that embraces the heritage of the Lakota tribe rather than fleeing from it as Dash ultimately does. Over the course of this series, Aaron has done fantastic work building the community of Prairie Rose, filling the book with a diverse array of characters who have their own distinct perspectives on the place they call home. All these separate visions become one cohesive environment in the hands of R.M. Guéra, whose artwork beautifully captures the deteriorating reservation and the natural splendor surrounding it. His meticulous attention to detail helps ground the story in reality, and he’s created a cast of weathered characters whose hardships are reflected in the lines on their faces, the clothes on their backs, and the scars on their bodies. This issue showcases the full breadth of Guéra’s talent, giving him the opportunity to draw a hard-hitting action sequence before moving on to the series of emotional epilogues, and his ability to balance violent spectacle with character-based drama is what makes him such a perfect fit for Aaron’s story. The final page summarizes the entire series in one evocative image, showing the rusted Prairie Rose road sign surrounded by garbage that threatens to fully consume it. It’s a downbeat conclusion, but at least Dash escapes before he’s consumed as well. Not enough praise can be showered on cover artist Jock, whose striking images have made every issue of Scalped jump off the stands. Last month’s cover was one of the series’ most visceral, but Jock goes for a calmer tone with his final cover, paying homage to the series’ first issue. Dash is wearing a similar white T-shirt similar to the one from #1, but his angry grimace is now a relaxed smile, and the image reflected in his shirt isn’t a casino and a curvy naked woman, it’s a sign for the upcoming Gina Bad Horse Memorial Community Center and the curve-less silhouette of Dash’s mother in a poncho. Adding further complexity to the image, Dash’s tribal headdress from #1 has been replaced by his child self, sitting on Dash’s shoulders, holding the man’s signature nunchucks. 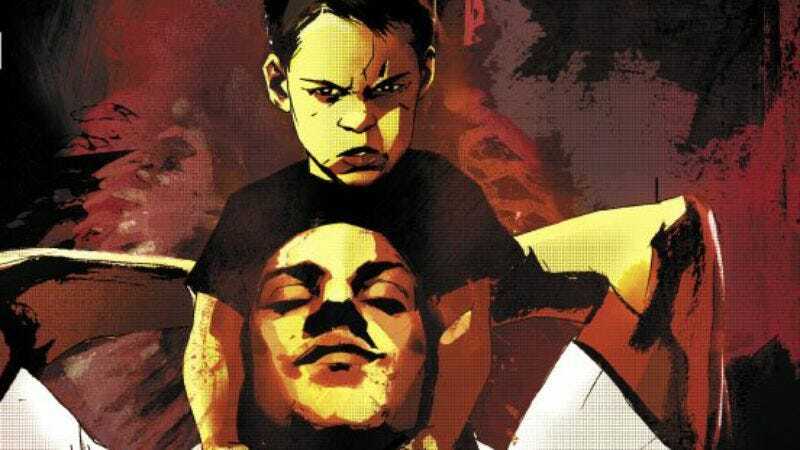 The pouting boy has an expression on his face similar to Dash’s on the first issue’s cover, and the character’s journey on this title has found him leaving that angry child behind as he comes to terms with his past and prepares to pave a new life for himself. The serene Dash on the cover of #60 doesn’t actually show up in the issue, but as he’s driven away from Prairie Rose on the last page, it’s easy to imagine a small smile breaking through his perpetual scowl.